Rest assured, New York City subway riders — Governor Andrew Cuomo has been listening to you! On Twitter. In his bedroom. Curled up in a ball. Crying. Of course, Andy, why exactly would passengers, who have been delayed everyday on every line for months, trapped in sweltering heat in total darkness, and injured after their car derailed and crashed into a wall, have any reason to be mean??? Clearly, you’re the victim here. Speaking at a competition to come up with an idea to best improve the transit system (because, irony), the governor did say he would be declaring a state of emergency on the MTA, the state agency that runs the subway, which would “allow us to expedite many of the normal government processes”—a process of doing absolutely nothing, but expedited. 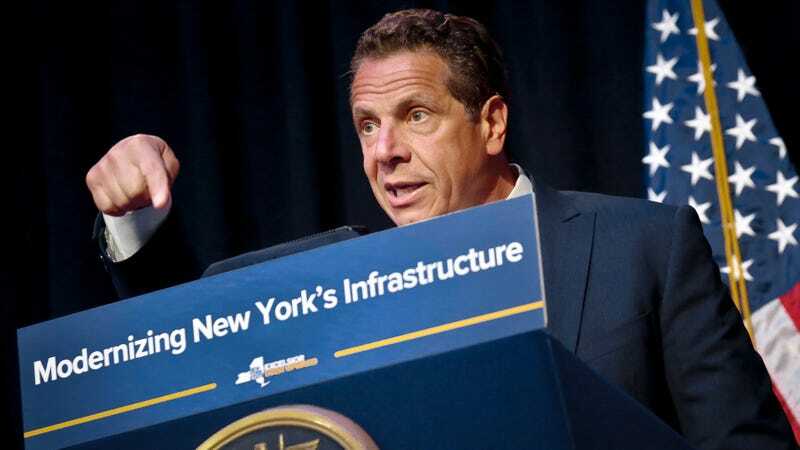 Cuomo also mentioned committing another $1 billion to the MTA Capital Plan, which promises $2.5 billion additional funding from the city government, and $8.3 billion from the state. The MTA’s 2015-2019 currently operates at $29.575 billion, and are seeking an increase to its total capital program budget to $32.457, mostly to help fund the NYC transit system. However, Cuomo has yet to earmark the allocation, and didn’t mention where the money would come from. Yesterday, dozens of angry subway riders demanded Cuomo do something by staging a protest outside of the governor’s city office in Midtown. The problem just isn’t funny anymore — the subway is continuing to deteriorate, and if Cuomo doesn’t give immediate relief, the injuries and threats to safety will only increase.